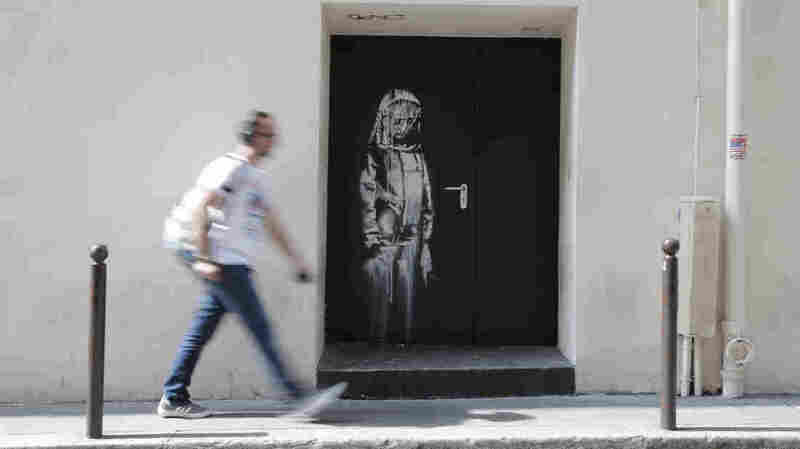 Mural Attributed To Banksy Stolen From Paris' Bataclan Concert Hall The mural — painted on an exit door — was believed to be a memorial to the victims of a 2015 terror attack that killed 90 people at the Bataclan. The painting in its original place at the Bataclan concert hall in Paris. Bataclan director Florence Jeux told NBC News that security camera footage depicts the thieves cutting the door away and driving off with it. According to Jeux, the robbery took roughly 10 minutes. "The painting was even protected by a Plexiglass. The whole door disappeared," Jeux said. "The security alarms went off and our security agency immediately alerted us." In a statement on Twitter, the Bataclan said "We are today filled with a deep sense of indignation. The Banksy artwork, a symbol of contemplation belonging to all — residents, Parisians and citizens of the world — has been taken from us." The club also made a statement on Facebook: "The very essence of urban art is to give life to a work of art in a particular environment and we are convinced that this work only made sense in that place, that is why we wished to leave it, Free, on the street, accessible to all." Milton Guevara is a news assistant at the Arts Desk.